W.E. Statham was one of the first people to produce boxed sets of chemicals and apparatus for the youth market. Starting with a chemistry set that he patented in 1842, Statham built a major scientific-entertainment business that lasted well into the twentieth century. His scientific apparatus won medals at the 1862 London and 1867 Paris International Exhibitions for “quality and cheapness”. Toward the end of the 1850s, Statham added microscopes and magnifiers to his business line. An official US report from 1867 stated, “A very good assortment of (microscopes) will be found at the establishment of Mr. W.E. Statham, No. 111, Strand. Mr. Statham constructs a variety of patterns and sizes of ‘youth’s’ and ‘student’s’ microscopes, varying in price from half a guinea to about four pounds; but he also constructs the more expensive forms of stands, and the superior objectives on the Lister principle, for prices correspondingly greater”. Statham being a chemist, he undoubtedly did not manufacture any of the microscopes that he sold. 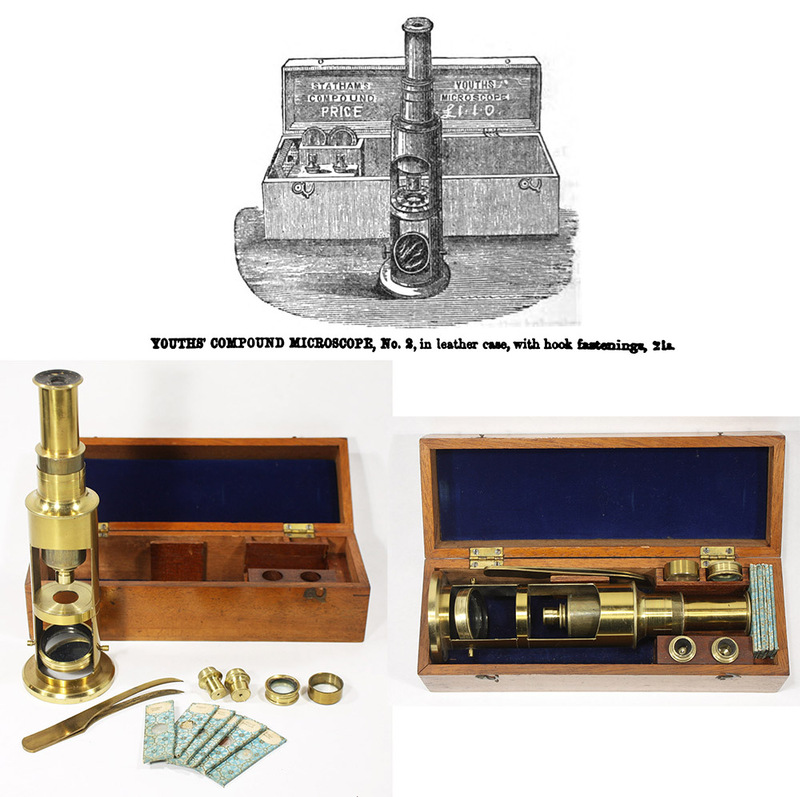 His 1867 catalogue featured an image for the “Children’s Portable Compound Microscope” that is identical to the one used at the same time by Birmingham manufacturer Parkes & Son for their microscope of the same name (Figure 6). Nonetheless, surviving microscopes with Statham’s name, and the images and descriptions in his catalogues and advertising, provide insights on mid-priced and inexpensive instruments of the time. The vast majority of Statham’s microscopes, chemistry sets, and other items bear the address 111 Strand, which was his address from ca. 1861 onward. There were some variations: 111 1/2 was used in an 1865 advertisement, 111a was widely utilized after 1867, and 111B, 111F, 111 A1, and 111 (2) were occasionally used in later years. In 1867, the Polytechnic Institution, Regent Street was included along with 111 Strand. Stratham exhibited at the 1851 London Exposition at the Crystal Palace, and maintained a presence at that address through at least 1867. An 1871 advertisement listed both 367 Strand and 111B Strand. Previous addresses include 16 Berners Street (1859-60), 302 and 312 Regent Street, “opposite the Polytechnic Institution” (1858-59), 29 Sussex Place, Rotherfield Street, Islington (1853-54), and 23/24 High Street, Newington Butts (1839-1842). Figure 1. 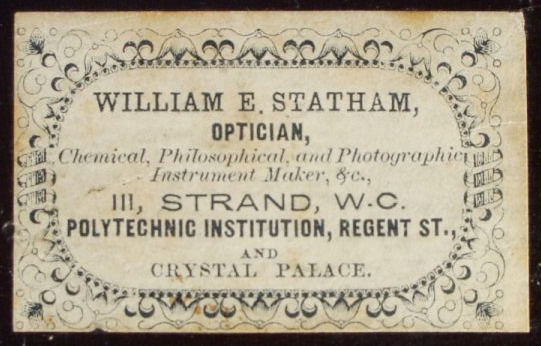 A Statham trade label, pasted inside the wooden case of the microscope/telescope shown in Figure 3. The addresses date this instrument to ca. 1867. Adapted for nonprofit, educational purposes from http://stichtinghistorischemicroscopie.nl/en/microscopen/combined-telescope-and-drum-microscope-sm-20. Figure 2. A “Youth’s Compound Microscope No. 1”, based on Benjamin Martin’s drum-style. The illustration on the top is from Statham’s 1867 catalogue. 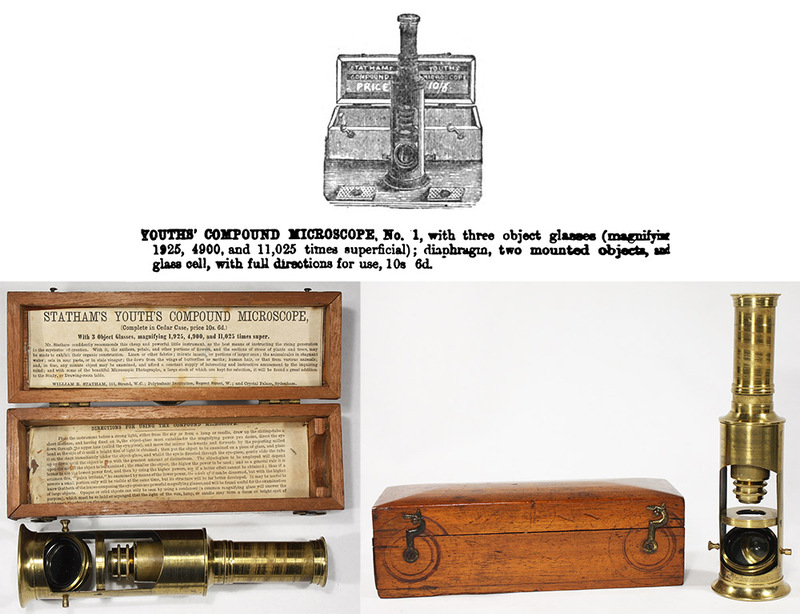 These microscopes are substantial, solid instruments (as opposed to the commonly-encountered, light-weight toy drum microscopes of the late 1800s - early 1900s). The label gives the addresses of 111 Strand, Polytechnic Institution, and Crystal Palace, thereby dating its sale to around 1867. Figure 3. A “Combined Telescope and Microscope”. The illustration on the left is from Statham’s 1867 catalogue. The address label shown in Figure 1 is associated with this instrument, dating it to ca. 1867. Adapted for nonprofit, educational purposes from http://stichtinghistorischemicroscopie.nl/en/microscopen/combined-telescope-and-drum-microscope-sm-20. Figure 4. A “Panopticon” telescope/microscope combination. The name first appeared around 1867. Figure 5. Statham sold a “Youth’s Compound Microscope No. 2”, which was larger than the No. 1 (Figure 2), and included additional features: three interchangeable objective lenses (as opposed to 2-3 screw-together button lenses on the No. 1), a circular live-box, a circular dish for aqueous specimens, forceps, and several small slides. The image on the top is from his 1867 catalogue. The instrument shown below is not marked as having been sold by Statham, but matches his descriptions. It is typical of small drum microscopes that were made for the youth or beginner market during the mid-1800s. Their robustness, changeable lenses, and other features readily discriminate them from the lightweight, cheap drum microscopes of later years. Figure 6. Statham’s 1867 catalogue included a “Children’s Portable Compound Microscope”, with an illustration that is identical to the one used by Parkes & Son in their catalogues, implying that Statham probably acquired them from Parkes for resale. A surviving version of this microscope is shown to the right. Figure 7. 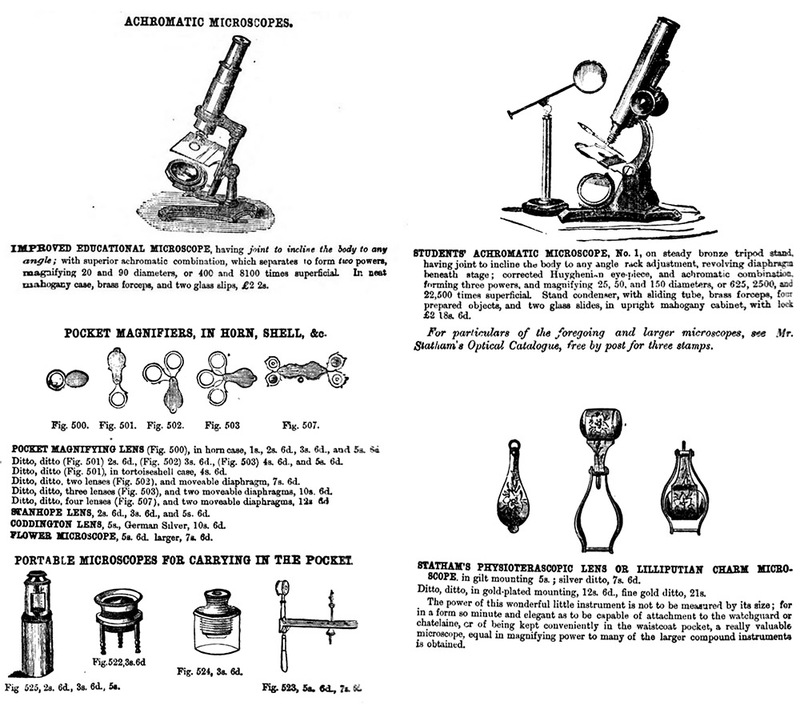 Additional microscopes and magnifiers in Statham’s 1867 catalogue. It notes that additional microscopes were described in a separate “Optical Catalogue”. Figure 8. 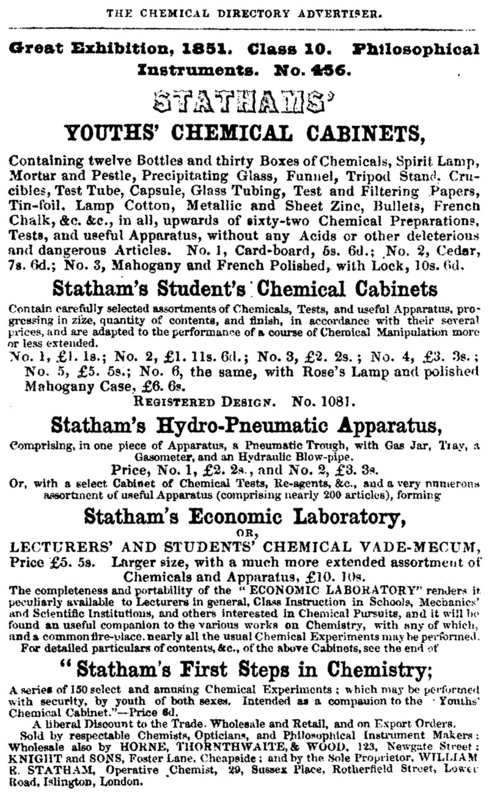 A “Statham’s Youth Chemical Cabinet”, and its entry from the 1867 catalogue. Figure 9. 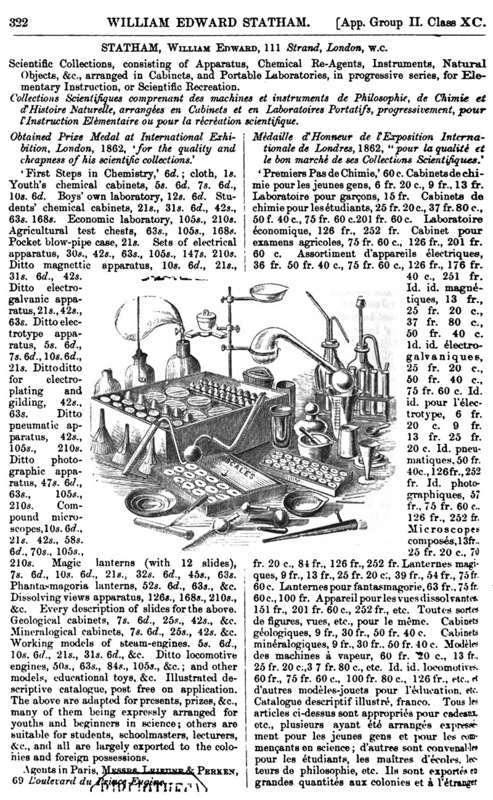 A larger, more complex “Student’s Chemical Cabinet”, and its listing in Statham’s 1867 catalogue. It features numerous pieces of glassware and other apparatus, along with chemicals, and a quality wooden case. It was available in several levels of complexity, each of a different price. This is the “£2 2s” version. Figure 10. “First Steps in Chemistry”, which was reprinted over several decades. This edition acknowledges Statham’s medals from the 1862 London and 1867 Paris International Expositions. Figure 11. A ca. 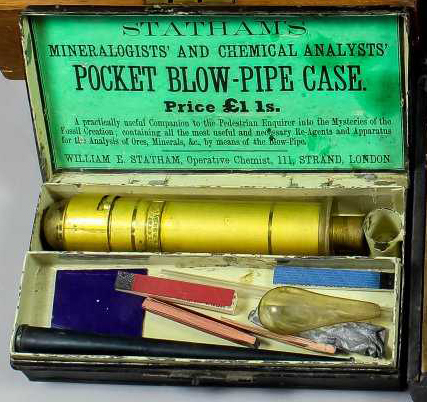 1870 cased blowpipe kit, for analysis of mineral specimens. William Edward Statham was born on July 11, 1816, the son of Edwyn and Sophia Statham. At the time, the family lived on Bath Street, near City Road, London. By 1839, he had formed W.E. Statham and Company, wholesale perfumers, operating from 23 and 24 High Street, Newington Butts, London. The “and Company” implies that the business had financial investors. The 1841 census listed Statham as a “druggist”, suggesting that he was already dealing in chemicals. 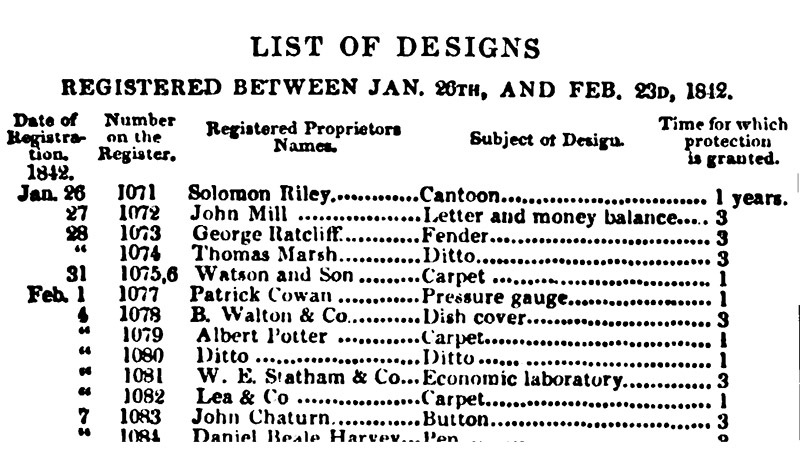 Statham & Co. patented the “Economic Laboratory” on February 4, 1842 (Figure 12). By December of that year, he was advertising six different chemistry sets, ranging in price from 5 shilling 6 pence up to 5 guineas (Figure 13). He also began selling his book, Statham’s First Steps in Chemistry. The business appears to have rapidly become a success. Statham married Mary Ann Attrill on September 30, 1843. The 1851 census records the couple and their four children having a domestic servant. Statham exhibited a range of chemistry sets and scientific apparatus at the 1851 London International Exhibition (Figure 14). His advertisements from that time onward referred to the business as “W.E. Statham”, indicating that he had bought out his “and Co.” investors. Statham’s sets were available for purchase from other scientific supply shops, including Horne, Thornthwaite, and Wood, and Knight & Sons (Figure 14). His entry in the 1853 Dublin Exhibition listed, “Chemical cabinets and portable laboratories for students, chemists, lecturers, &c.; agricultural test chests, for analysing soils, manures, &c.; toxicological test chests, for detecting and analysing poisons; hydro-pneumatic apparatus combining a pneumatic trough, large gas jar tray, hydraulic blow-pipe and gasometer; pocket and other blow-pipes for mineralogists; mineralogical cabinet; photographic apparatus, chemicals, &c.”. 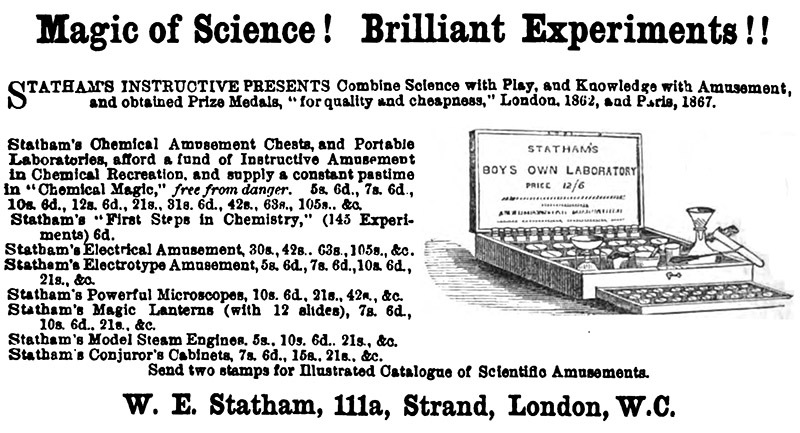 Microscopes began appearing in Statham’s advertisements in 1858 (Figure 15). 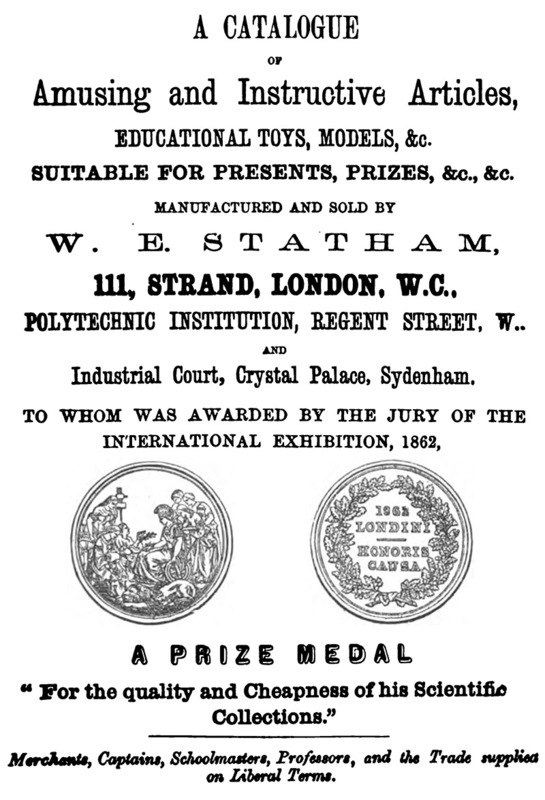 The 1867 Catalogue of the Educational Division of the South Kensington Museum included a 20-page catalogue of Statham’s goods (Figures 2-9 and 18). W.E. Statham died on December 18, 1899 at the age of 83. At the time, he and his wife were living in East Dulwich, Surrey. His eldest son, Francis continued the business into the twentieth century. Figure 12. W.E. Statham was awarded a patent for his first chemistry set in early 1842. Figure 13. A December, 1842, advertisement from W.E. Stratham. His shop was then located at 23 High Street, Newington Butts, London, the site of his previous perfume business. Figure 15. 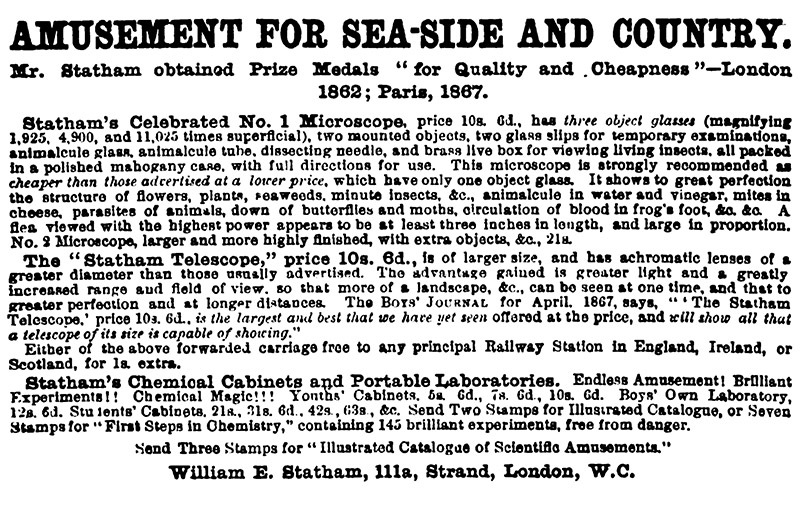 An 1858 advertisement, the earliest identified indication of Statham selling microscopes and other optical instruments. At that time he was located at 302 Regent Street, opposite of the Polytechnic Institution. Figure 16. An 1860 advertisement, when Statham was operating from 16 Berners Street. Figure 17. Description of Statham’s entries in the 1862 London International Exposition. By that date, he had moved to 111 Strand. He won a medal for “quality and cheapness”. Figure 18. The first page of W.E. Statham’s 20-page catalogue that was included inside the 1867 “Catalogue of the Educational Division of the South Kensington museum”. Images from the catalogue are illustrated above in Figures 2-9. Figure 19. Statham’s advertisement from the 1867 Paris International Exposition, in English and French. Figure 20. 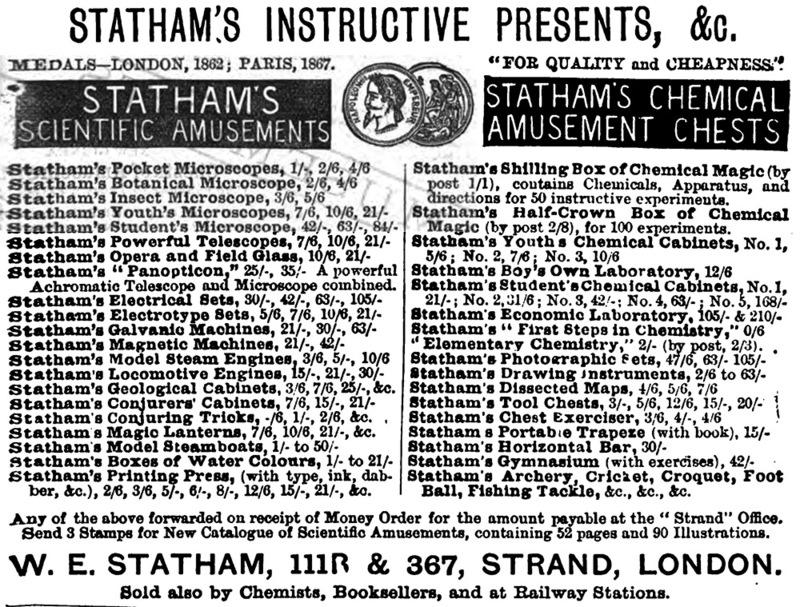 An 1867 advertisement for Statham’s microscopes. Figure 21. Another 1867 advertisement. Figure 22. An 1871 advertisement. Figure 23. An 1883 advertisement. Statham then offered over 10 different microscopes. Figure 24. A twentieth century Statham chemistry set. 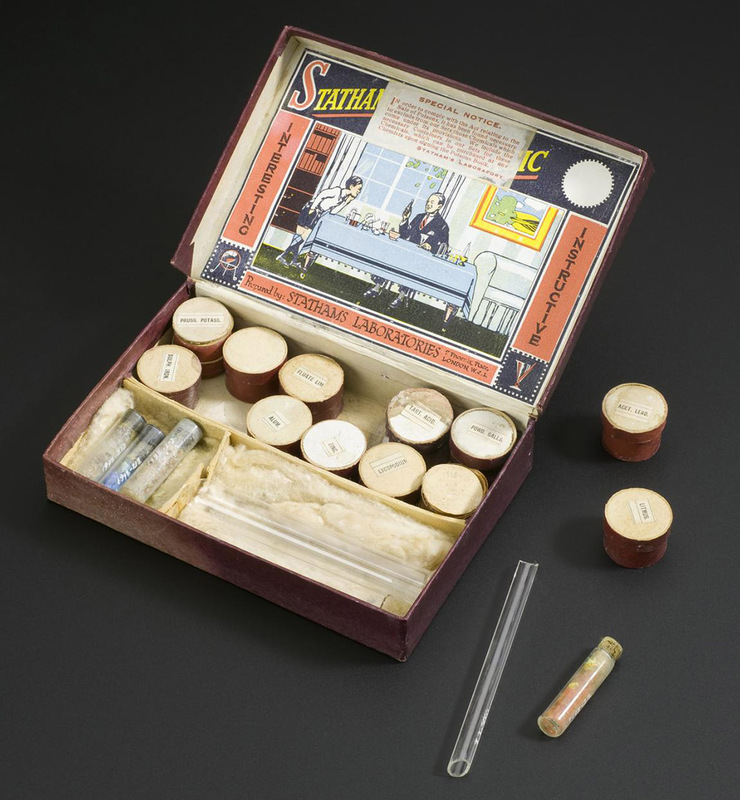 Adapted for nonprofit, educational purposes from https://collection.sciencemuseum.org.uk/objects/co447570/stathams-chemical-magic-chemistry-set-educational-toy-chemical-toy. Post Office Directory of London (1860) “Berners street … 16, Statham, William Edward, Optician”.